First time I ever though of calling something ‘Canglish’. Whatever you do, it’s likely that you feel surrounded by people who do the same thing, and worse, that you are beset by comparison with the greats in your field. If you are an investor—why are you not Warren Buffett? A programmer—why aren’t you Mark Zuckerberg? I first noticed this when I started the PhD I never finished, back in 2002. Everyone around me either had or was doing a doctorate, making something commonplace that I had once thought immensely special and difficult to even begin. I had come so far, and already I felt myself a failure. These days, the comparison is with authors. I have two books out, a third that may be done by Christmas, and another to write next year. Still I compare myself… Why do I not sell as much as Joe Konrath? Why do I not write as well as Stephen King? Will I ever get there? I fear I never will. I aimed to be a writer, I became one, and now I am surrounded by writers and beset once more by comparisons with friends and the faraway famous. Today my fellow author Justin Woolley writes about his anxiety on entering bookshops, being made sad by wondering if he’ll ever make it onto the shelves and whether he has anything, really, to add to the hundreds of thousands of books already out there. I have a different sadness when I enter bookshops, and it’s to do with having moved on to ebooks. I have travelled and moved a great deal in my adult life, and know that I’ll do still more of that in future. Ebooks are instantly available and take up practically no room. Now I have the possibility of taking my entire library with me wherever I go, I don’t want to buy any more paper. And this attitude, I know, will perhaps spell the death of bookshops, which have for so long been beacons of literary culture, streetside reminders that books exist and are wonderful. I fear that people may forget books altogether if bookshops disappear. But what interested me most about Woolley’s post is his answer to the question of what one has to add: oneself. Each person has a unique set of life experiences that can become a distinctive outlook and voice. This is so whether you write about things close to your own life (as I do), or more intentionally heightened or extraordinary experiences in genre fiction. I’ve always believed very much in this, and feel that it poses a personal as well as professional challenge. Develop your voice and polish your style, by all means, but when you begin to show the person that you are in your work there is also the question: am I good enough to be the voice that speaks to people. Now, I believe in unconditional self-esteem. You are, I think, what you are when everything has been taken away from you. Imagine what it would be like if you lost your love, your money, your health, your work. Imagine that you could neither do nor have anything that you love. Now imagine that even your name and your life is taken away—as you know one day it will be. How can you be happy, knowing this? How can you believe in yourself? In the middle of this question lies what the Tao Te Ching calls “the hidden within the hidden,” which is the basis of our fundamental worth. We all have this. That’s my apparently gloomy way of saying that we all have an indestructible basic worth. It is, I assure, you, more hopeful than it sounds if you explore it: a source of strength in the darkest times. But as a writer something more is required of you than simply to be, or even to speak. Is your unique voice something that gives value to others? Does it entertain, console, or enlighten? Does it make the world better? For it is possible to merely perpetuate one’s insecurities and prejudices through what one communicates. When I examine my own life, for instance, I realize how motivated I have been by pride and fear, and how harshly I have judged myself and others. Kiss Me, Genius Boy and the other volumes in the No More Dreams series reflect this, to some degree. I hope that as I communicate some of my experience and it shows others that they are not alone, it’s also recognized that I’m satirizing the protagonists. Joshua and Lily are flawed people, not entirely to be emulated. When I write my next book after the No More Dreams series is finished, I want to go on and communicate a vision of life and love that is more open-minded and hopeful than the one held by the worst aspects of my old self. To do this I need to understand and overcome the weaknesses in my mindset so that I can give out more positivity and love. Not only does my writing have to be as fully mine as it can be, I need to be, as much as possible, a wise and fulfilled person so that what flows out of me is good. We write for others, and this requires us to become our best selves so that we can speak from that place. This is a great challenge, and it makes writing far more than a job or a hobby: it can be a whole life’s work. 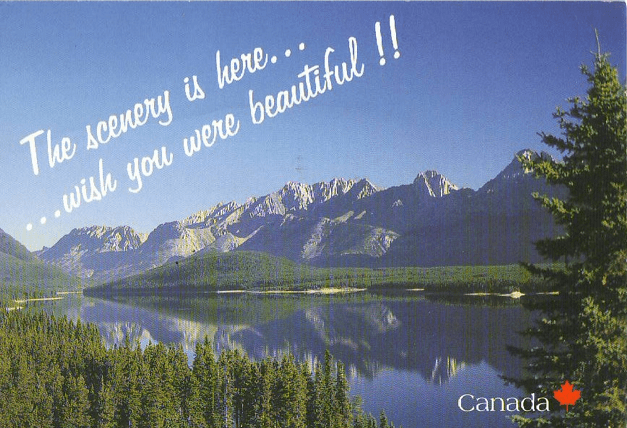 Image: Canadá, CC BY-SA 2.0 alicedice, 2008. Next Next post: Why the old posts?